Optimize and accelerate Snowflake to achieve all your business goals. Whether it’s optimizing your data architecture, deploying best practices, leveraging partner expertise, or operationalizing your modern data analytics, we can help. We’re ready to assist you with onboarding, re-architecting, technical guidance, expert training and resources , and helping you realize your project milestones and objectives. With Snowflake Professional Services, you’ll achieve project outcomes faster and deliver data-driven insights and ROI sooner than you expected. Our team of experts will help reveal additional use cases for modern data analytics and secure data sharing for even greater benefits across your organization. You’ll get the advice to help you with various tasks related to deploying Snowflake: network security, single vs. multiple accounts, authentication, roles, warehouse management, cost management and chargebacks. We’ll help you identify and plan your first data source migration to Snowflake, and provide strategic recommendations on who you should involve in your migration planning and preparation. You’ll get the guidance needed to define and create roles and users within Snowflake, including role-based access control, security, and governance. Learn how to utilize Snowflake features and functionality to improve usage, performance, data loading, and resource management and utilization. Your own Snowflake technical account manager will help you plan your forward-looking strategies, facilitate technical conversations with internal stakeholders, manage feature requests and escalations, and more. From our fundamentals training to our role-based workshops, we have the training to meet your needs and enable your success. Snowflake’s Fundamentals Training courses introduce you to our data warehouse as a service, data migration best-practices, and concepts needed to successfully get started with Snowflake. Learn how to use and administer the Snowflake platform. These sessions present best practices and methodologies required for effective data integration, management, and performance optimization. Data analysts, data scientists, administrators, DBA’s, and data engineers will learn advanced capabilities in these workshops via hands-on lab work, deep-dive focused material, and best practices. Fill out the form below and we’ll set you up for success. 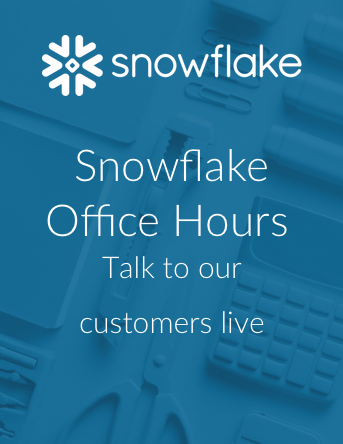 We are an early adopter of Virtual Private Snowflake because it gives us the ability to process data at lightning fast speed and deliver automated, intelligent solutions to our customers in real time. Our internal BI team can wholly commit to providing value to the business because the data warehouse is managed in the cloud as a service by a team of Snowflake experts . Snowflake’s unique architecture enables all of our teams to work with data in one system, without impacting performance and without DBA experience. Children ages 2 to 7 can be very impatient, they’re just clicking all over the place. If you are not providing a learning experience that is responsive for them, they will go to a different product. It is critical for us that our ABCmouse.com product is very performant. By eliminating several manual, labor-intensive steps in the process, we can now manage up to five times as many environments with the same staff at a much higher level and with a lower risk profile.